S. Ernestine Foskey, who was educated at the Cincinnati Art Academy under Frank Duveneck and a prolific SC artist, is one of the Cincinnati artists featured in the Sisters of Charity Art Room. The Art Room, constructed between 1892 and 1895, with its ornate woodwork balcony, wrought-iron railings on the stairs and second-floor balcony and ceiling medallions make it one of the most beautiful rooms in the building. A rosette theme is carried through in the woodwork under the balcony, along the outer edge of the balcony, and in the ceiling. 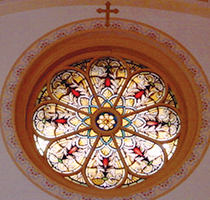 The stained-glass windows in the doors were created by art students at the College of Mount St. Joseph under the direction of S. Augusta Zimmer. True to its purpose, this room features paintings, furniture, pottery, and other art pieces, many that were gifts to the Community by family members of the Sisters, friends, and clergy. Tucked behind the Mount St. Joseph Motherhouse, along the rolling green hills and amongst large shaded trees, is the Mount St. Joseph cemetery. More than 1,700 Sisters are buried on the grounds; each year close to 20 more burials take place. The first grave, June 1883, was that of Mother Regina Mattingly. In 1909, a center circle was reserved for the graves of the original members of the Cincinnati Sisters of Charity; future Mothers were also buried here. At his own request, Bishop Thomas S. Byrne (a former chaplain for 18 years) was buried in the circle. Located in the St. Theresa Courtyard of the Mount St. Joseph Motherhouse, the Clifford Bird Observatory opened in the fall 2007. Named after Sister of Charity Adele Clifford, a former College of Mount St. Joseph president, past biology department chair and avid bird watcher, the bird banding station allows the Sisters of Charity, and the College of Mount St. Joseph, to educate the public, inventory natural areas and become part of the global effort involved in bird conservation. Re-organized in 1991 and brought up to award status by S. Giovanni Vastano in 1994, the Motherhouse Gift Shop was named the best in Cincinnati by the 18th annual Best and Worst Edition of Cincinnati Magazine. Today the Gift Shop, located on the south side of the first floor next to the Arts and Crafts Room, includes items such as rosaries, greeting cards, prayer cards, baby blankets, books and more. For more information contact 513-347-5758. Across the hall is the Mount St. Joseph Talent Education Cello Studio. The Motherhouse grounds are rich in beauty and history, the campus’ 75 acres providing ample spots for contemplation and intrigue. Come join us on a virtual tour as we explore nine such places and learn their stories. [SEVEN MUST-SEE FEATURES] Built in the shape of a Latin cross, this magnificent four-story chapel is a blend of Romanesque and Renaissance architecture. Vaulted ceilings coalesce to form a central dome, which is enhanced with a mural painted by Richard Bachman. The central dome contains a monstrance holding the Blessed Sacrament surrounded by four doctors of the Church who were devoted to the Blessed Sacrament. The sanctuary mural, depicting the Blessed Mother, was done by William Lambrecht. The Community completed a substantial renovation of the chapel in 2000. A circular theme is carried out in a new octagonal altar which sits on a circular peninsula extending into the body of the chapel, a new baptismal font, and a semi-circular seating pattern using both new chairs and some of the original pews. The marble from the original altar was reconfigured and used in the baptismal font and in the base of the tabernacle. This large room, directly across the hall from the chapel, was known as the Archbishop’s Room. The eastern section of the room was a bedroom where in case of inclement weather he would stay overnight. The western part was used as a vesting room for Mass and also for private conferences with the Archbishop. In 1984, after renovation, the room was renamed and used for receptions and to display panels depicting the history of the Community. Built in 1886 as part of the rebuilt west wing of the Motherhouse, the McCann Room served as St. Aloysius Academy’s Infirmary from 1891 to 1906. Later it was used as a large classroom for Mount St. Joseph Academy and the College of Mount St. Joseph. In 1987 the room became part of the Archives and is used as a display room for historic artifacts. It was named the McCann Room in 2004 to honor S. Mary Agnes McCann, an outstanding Sisters of Charity archivist and historian. Mother Margaret Hall, attached to the Mount St. Joseph Motherhouse, provides a caring home for Sisters of Charity who need nursing assistance. A licensed nursing home, Mother Margaret Hall provides rehabilitation, pastoral care, social services and activities for Sisters in nursing and in Assisted Living. Mother Margaret Hall is committed to the holistic approach in health care. It is named for Mother Margaret George, the first Mother of the Sisters of Charity of Cincinnati. The Mount St. Joseph Post Office, established in 1892 and a U.S. postal station, is a clearing house for inter-campus mail – Motherhouse, Mother Margaret Hall, Bayley, Mount St. Joseph University and the neighborhood. The Post Office has moved four times since its original location on the second floor of Marian Hall. Today it is located on the first floor of Marian, and continues to serve as a gathering place of activity for Sisters, students and neighbors. The Rose Room is a gathering space for retreats, meetings and social events. Along with the adjoining hallway, it offers examples of art and artifacts either done by or associated with the ministries of the Sisters of Charity. The Spirituality Center provides opportunities for spiritual enrichment to the Community through a wide variety of programs, offering weekend/overnight retreats, private retreats, days of reflection, evening prayer programs, massage therapy, and a labyrinth. The Center also provides individual spiritual direction for women and men. Motivated by the Sisters of Charity vision to share faith and resources, the mission of the Spirituality Center is to provide opportunities for growth by deepening faith life, strengthening efforts toward community building, reaching out to the needs of the community and heightening awareness of Gospel values. Learn more at www.srcharitycinti.org/spirit.htm. S. Augusta Zimmer’s art is featured in two of the parlors or sitting rooms located on the second floor near the main staircase. Another parlor displays artifacts associated with S. Blandina Segale. These rooms are used for receiving visitors, meetings and retreats. 1852 - Sisters of Charity of Cincinnati established. 1853 - Mount St. Vincent Motherhouse established in Cincinnati. 1857 - Mount St. Vincent Motherhouse moved to Cedar Grove in Cincinnati. 1869 - Sisters purchased Biggs Farm in Delhi Township west of Cincinnati and moved novitiate there. 1883 - First Sisters buried in Mount St. Joseph cemetery. 1884 - Fire destroyed the Motherhouse. 1885 - Mount St. Joseph established as Motherhouse of the Sisters of Charity of Cincinnati. 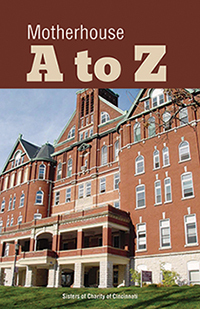 1886 - Marian Hall opened as first building in new Motherhouse complex. 1892 - Construction on center and east wings, chapel, and St. Mary’s Hall began. 1901 - Immaculate Conception Chapel dedicated. 1906 - Mount St. Joseph Academy opened. 1920 - College of Mount St. Joseph opened. 1927 - Seton Hall completed. 1930 - Mount St. Joseph cemetery enlarged and landscaped. 1937 - St. Vincent’s Hall completed. 1962 - College of Mount St. Joseph moved to new campus. 1984 - Celebration of the centennial of Mount St. Joseph Motherhouse. 1997 - Mount St. Joseph cemetery enlarged and landscaped. 2000 - Renovation of Immaculate Conception Chapel completed.